The Twenty Cent coin made its appearance in 1875. Soon, complaints started rolling into the Mint because its size and design were too easily confused with the quarter dollar. The coin never did gain popularity, and was discontinued in 1878. The employees at the 1875 Carson City Mint pushed hard to strike the new Twenty Cent coin ahead of the San Francisco Mint. It is not clear who won the race, but Carson City claimed the honor onward as a source of pride. Carson City issued the Twenty Cent coin for only two years. Only 20 or so of the 1876-CC exist today and sell for six figures, so the 1875-CC is the only chance most of us have of ever owning a Carson City Twenty Cent coin. The 1875-CC is scarce in its own right and a longtime favorite. During its time of active service, the Twenty Cent coin was scorned by the population in general. Coin collectors of today take a much different view of the odd denomination, as evidenced by the value trend chart of the 1875-CC Twenty Cent coin. The blue line above depicts the percent value increase of the 1875-CC since Year 2000. The red line charts the progress of the Rare Coin Values Index, which calculates the percent change over the same time period of a pre-selected group of 87 rare US coins. The 1875-CC Twenty Cent piece is one of the 87 coins that comprise the Index. 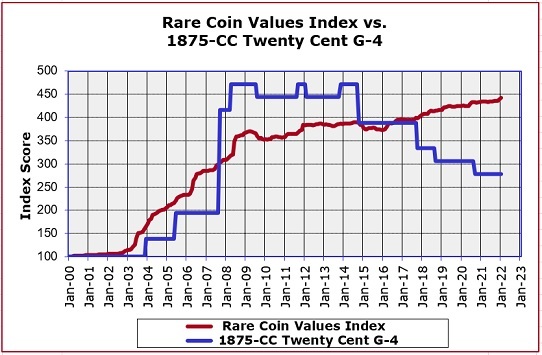 As the blue line shows, the 1875-CC Twenty Cent coin has soared above the Index average. The Index is updated monthly.